Apple says most location data is collected anonymously except for services like Find My iPhone that require your personal information in order to work. Apple says it uses the location data it collects to "provide and improve location-based products and services." 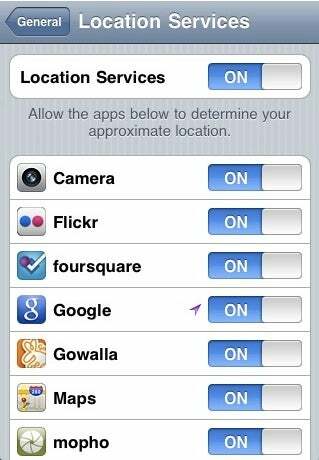 IPhone, iPod Touch, and iPad users can access a global control that allows you to turn off location tracking under Settings>General>Location Services. This control prevents Apple from tracking your device's location, but also makes it impossible for users to take advantage of location-centric applications such as Foursquare and TomTom's turn-by-turn navigation. Users who have iOS 4, the company's latest iPhone operating system, can also access a list of specific applications that use your location information. (Click on the image for a closer look.) The list allows you to turn off location information access for individual apps, and also lets you see which applications have used your location data in the past 24 hours. When you first launch an application that needs your location information, you must explicitly authorize it to do so. Apple has been fairly transparent about how it deals with customer location data, and provides some good tools to enable you to control your location information. Nevertheless, Markey and Barton are asking some important questions and the answers will benefit all Apple customers. Most notably, the congressmembers want to know how Apple stores your location data anonymously. The pair also want Apple to explain in detail how the company intends to use the location data it collects. Missing from the list of questions, however, is a specific inquiry into how long Apple is storing location data. The representatives have asked Jobs to respond to their questions about Apple's handling of location data by July 12. You can read the full text of the letter to Apple here (PDF).